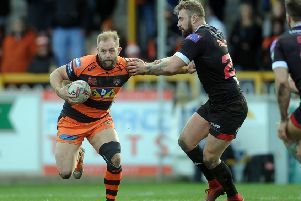 Top of the table Castleford Tigers face the acid test of their title credentials when the much anticipated first meeting with Wigan Warriors takes place at the DW Stadium tonight. After winning six of their first seven games in 2017 and averaging more than 40 points a match the Tigers cannot go into the game in much better form, but expect to face a stiff test against reigning champions who have faltered recently, but will be pumped up by their head coach Shaun Wane. The much publicised differences between Wane and Cas boss Daryl Powell has added extra spice to a game where already the stakes were high. On there being no love lost between the respective coaches, Powell said: “It’s just competitive – he’s competitive, I’m competitive. “We’ve had some great battles over my time at Cas and he’s been at Wigan a long time. Despite their blip, Powell expects Wigan to be strong. He said: “They have had a lot of injuries, but I think they’ve been high quality over the last two years, how they’ve been able to integrate the young players and still they won the comp. “That was a massive pat on the back for their youth system and the young players they’re bringing in. The games they’ve played, even with the injuries they’ve had have been exceptionally tight. “They’re a difficult side to beat. We need to come up with our best performance. “Going away to Wigan’s always the big test. We’ve found it really difficult over the last few years so it’s going to be a difficult challenge for us. We need to bring out everything we’ve got and be really solid defensively. Cas will be backed by another huge away following with expectation level high among fans who have made the Wigan match a kind of third derby. Powell added: “It’s intense and there’s a really good rivalry there. We’re going to take a lot of fans over and we are travelling outstandingly well. “We’ve gone over to Lancashire on Friday nights and it’s been packed. It’s great to see. The support’s been awesome. We’ve had big gates against Catalans and Huddersfield that are notoriously a little bit less so everything’s going for us in a positive way. It’s a statement game for us, clearly. “They are a great side and we need to play well to beat them. “I think it’s been built up a bit, but we’ve just been trying to focus on one game at a time and I think we’ve been okay at doing that. “We’ve responded from getting beat a couple of weeks ago and we’re looking forward to it. It’s a big game. “Going over to play at Wigan always has been. When I played at Wigan I always enjoyed it and I think it’s great going there as one of the biggest challenges in the game. Before naming his side, Powell will check on the fitness of forwards Junior Moors and Oliver Holmes and winger Joel Monaghan, who all picked up knocks in the win over Huddersfield, while Greg Minikin is back in the 19-man squad, but also faces a fitness test.